Stachys is a strong border plant. It provides year-round colour with evergreen woolly, silver white leaves, and spikes of striking deep-rose flowers in July and August. It grows to a height of 35-40cm and is useful in borders as well as providing ground cover (it is good at suppressing weeds). It is also grown as a culinary herb, and used for garnishing food. Stachys likes full sun and part shade and rich well-drained soil. It is low maintenance once established and will grow in drier soils. 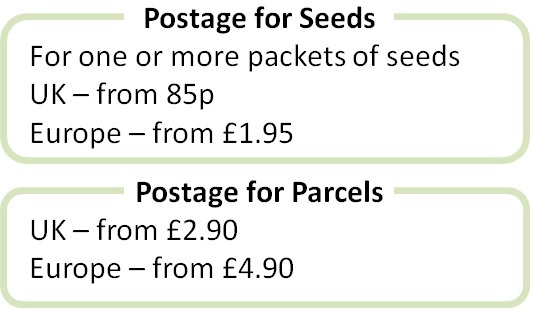 Pack of 150 seeds. Sow when you can provide germination temperatures of around 21°C. Autumn sowings need protection during the winter. Easy to grow. Sowing instructions and a colour photo are printed on the packet. Conditions Full sun to light shade and rich well-drained soil. Sow Sow in a tray of not-too-moist seed compost. Cover the seeds very lightly with compost or vermiculite. Do not exclude light, which helps germination. Keep at around 21°C and seedlings emerge in 2-4 weeks. Pot on and grow until the plants are ready to plant out after the last frost in sun to part shade and rich well drained soil. Protect autumn sowings over winter in a cold frame or greenhouse. Grow Cut back flower stalks or untidy leaves in late summer or autumn once they have died down. The leaves are evergreen and do not die back in warmer gardens and warmer winters. If the leaves die back in winter, they start growing again in spring. Mature plants can be divided in spring.